The full potential of the musical magic contained on vinyl discs can only be realised by the passionate treatment of the low level signals emanating from the disc and stylus.Class ‘A’ circuitry is renowned for its recovery of and synergy with, low level signals and Sugden is synonymous with Class ‘A’ circuitry. This combination is fully exploited in the, PA-4, dual mono, and two stage Class ‘A’ Phono amplifier. The two stages are the moving coil pre-amplifier and the moving magnet, RIAA-correction amplifier. The moving coil stage is a Class ‘A’ current feedback circuit and the moving magnet amplifier a Class ‘A’ voltage feedback circuit incorporating the RIAA correction in the negative feedback loop. DC servo circuits enable direct coupling of the musical signal from moving coil input to final output. 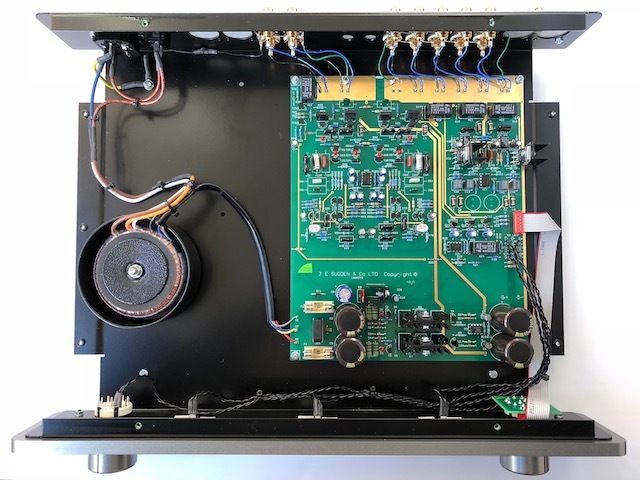 The power supply, which Sugden considers an integral part of the amplifier circuitry, is a ‘current shunt’ design with a specially designed voltage regulator to prevent rising impedance with higher frequencies. Constructed with components of exceptional quality, hand assembled on long-term stability gold plated circuit boards; the resultant performance is a phono stage of absolute transparency and natural sound. The user interfaces are all externally selected i.e. input selection 1x MM, 2x MC, the latter with external loading facilities .There are two stereo outputs for recording or line amplifier. Input – Two moving coil and one moving magnet. Outputs – Two line level. Loading – MC1 and MC2. Front Panel Controls – MC1, MC2, MM rotary selector, standby and input indicators. Input Sensitivity – Moving Coil 0.15mV, Moving Magnet 3.5mV. Loading – Moving Coil 470 ohm and 100 ohm, Moving Magnet 47k. Frequency Response – 30Hz to 30kHz +/- 0.3dB. Signal to noise – >70dB. Recommended Retail Price – AUD$4,050.00.